Originally from Denver Colorado, Augustine Boyce Cummings is an artist living and working in New York City. He is a recipient of The Rome Prize and is a Fellow of The American Academy in Rome since 2006. Cummings has exhibited nationally and abroad including New American Talent 19 at ArtHouse Texas / The Jones Center. Mr. Cummings studied undergraduate at The School of The Art Institute of Chicago, where he was a Merit Scholar. He earned a Masters Degree in Fine Art (MFA) from The School of Visual Arts in New York City. 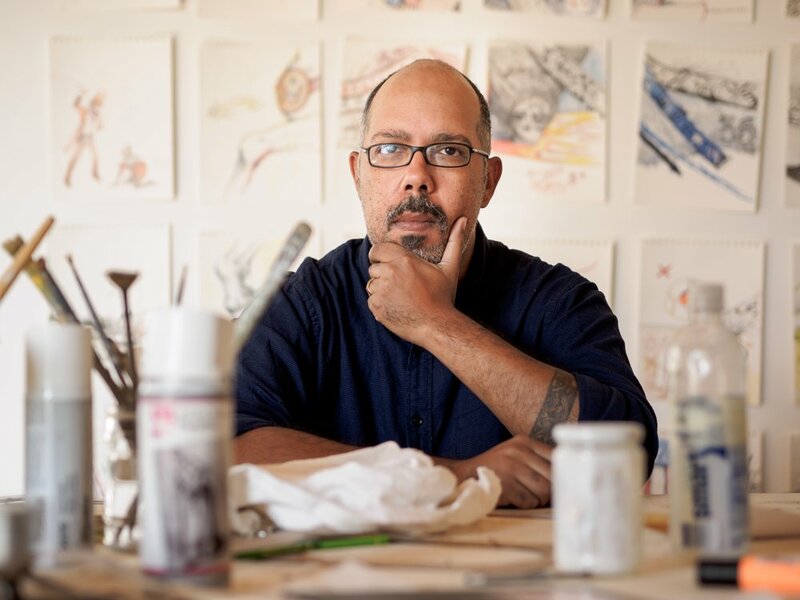 Cummings has received grants from ARTISTSPACE in NYC and The Lower Manhattan Cultural Council and was the recipient of the Stacey S. Sussman traveling fellowship from the School of Visual Arts. His work is in the prominent collections of Barbara Goldsmith, Agnes Gund, John Guare, Nancy Negley among many others. in the fall of 2017 he took residence as a Fellow of the Civitella Ranieri Foundation in Umbertide province of Perugia, Italy. Augustine Boyce Cummings is an instructor of mixed media collage/painting at The Art Students League of New York. Currently he is working with Sitelab in conjunction with Artprize to produce a large scale installation piece in Grand Rapids Michigan. I’ve always been an artist, it’s how I process the world. I believe that what you say is just as important as how you say it. Maybe more. My work is influenced by graffitti, science fiction, illustration, cartoons, renaissance painting. artists like Andrew Wyeth, Bill Traylor, Barnett Newman, Basquiat, Walt Disney. I use Symbols, trumpets, ellipses, blue birds, skulls, telephone poles, stitching, animals, people, landscape , houses. It's all somewhat open to interpretation by the viewer. I’m at piece with the ambiguity. I like materials. I sew with twine, build with wood, make use of surfaces, texture, and veneer. I like being free to use whatever I see fit. My subject matter has increasingly been focused on modern themes. There is a lot of chaos and strife in the current work. I think that this is a natural reflection of the world given the current state of things. -2017 Fellow - Civitella Ranieri Foundation. Umbertide province of Perugia, Italy. Chuck Close Fellow in Visual Arts. The American Academy in Rome. Rome Italy. - 2008 EXITART NYC, Ida Applebroog award finalist. - 2004 ARTISTSPACE Independent Project Grant. - 2004 Lower Manhattan Cultural Council Grant. - 1999 Stacey S. Sussman Traveling Fellowship, School of Visual Arts. - 1992 Merit Scholarship,The School of the Art Institute of Chicago. Exhibitions listed are invitational, juried, or curated. -2017 "Fellows exhibition" A.B Cummings, Jackie Saccocio, Milton Momen, Carl D'Alva. Civitella Ranieri Foundation. Umbertide province of Perugia, Italy. - 2015 “Small Works” Projeckt722 Gallery. Brooklyn NY. - 2014 “Ten” Cindy Rucker Gallery NY.NY. - 2013 “Groundswell 17th Annualexhibition and auction”. Christies Auction House NY.NY. - 2012 “Art and Social Activism”, Nicholas Cohn Art Projects Qns NY. - 2011 GAGA Arts Center. Garnersville, NY. - 2011 “Provisions” Nathan Cummings Foundation. NY, NY. - 2010 “Art Stars of The 21st Century" GAGA Arts Center, Garnersville, NY. - 2009 “Two Degrees Of Seperation” Gallery Satori, NY, NY. - 2009 “Gone To The Dogs” Denise Bibro Gallery, NY, NY. - 2009 “Aspiration Inspiration “ The Wassaic Project, Wassaic, NY (Curated by Nicholas Cohn). - 2009 “Lover” On Stellar Rays Gallery. NY, NY (curated by Candace Madey). - 2009 “Double Dutch” GAGA Arts Center. Garnersville, NY (Curated by Jon Shorr). - 2008 “Fountain Art Fair” Jonathan Shorr Gallery , Miami FL. - 2008 “Animus Botanica” Denise Bibro Gallery NY, NY. - 2008 “Flight of the Mechanical Bee” Korean Cultural Center NY, NY (Curated by Eun Young Choi). - 2008 “White on White” Number 35 GalleryNY, NY. - 2008 “Art Futures, New Talent” Gallery Camino Real, Boca Raton FL. - 2007 “Delicatessen “ Florida Atlantic University. Boca Raton FL..
(curated by Dianna Sphungin ) chaired panel, lecturer. - 2006 “Aqua Art Fair” . Aqua Hotel, Winkleman Gallery. Miami, FL. - 2006 “Year 06 Art Fair” .Winkleman Gallery, London England, UK. - 2005 “Theory”, Jonathan Shorr Gallery, NY, NY. - 2005 “Group Show” Air Space, NY, NY. - 2004 “Americano’s”, Arcaute Arte Contemporaneo, Monterrey, Mexico. - 2004 “Graphic”, Fredricks Freisier Gallery, NY, NY. - 2004 “Slice and Dice”, Visual Arts Gallery, NY, NY. - 2004 “The Truck Stops Here”, Plus Ultra Gallery”, Brooklyn, NY. - 2003-2007 “NEW AMERICAN TALENT #19”, Curated by Jerry Saltz. ArtHouse Texas. for the Jones Center for the Arts. Austin TX. - 2003 “Lost Dog Found”, 526 Gallery, NY, NY. - 2001 “Synthetic Distopia”. Curated by Loren Madsen, Wooster Gallery, NY, NY. mobile installation with Alois Kronshlaeger, Kate Gilmore, Diane Carr, Tom Lendvai, Elaine Chow, Chris Rieger, Robyn Winston. -2017 Civitella Ranieri Foundation. Umbertide province of Perugia, Italy. -2009 School of Visual Arts, MFA program. New York ,NY. Invited Alumni Artist Lecturer. -2007 The American Academy in Rome. Rome Italy. Artist Fellow Lecturer. -2007 Florida Atlantic University, Boca Raton FL. Featured Artist Lecturer and Panelist. -2006 Temple University (abroad) Rome Italy, Vistiting Artist Lecturer and MFA critiques. -1999 Albert Einstien College of Medicine, Forshiem Gallery. Bronx NY. Featured Artist Lecturer.